Enderby resident Laura wins national accolade after 9st (120kgs) weight loss! Enderby resident, 35yr old Laura Cosbie, a Slimming World Consultant, has been crowned “Slimming World’s Consultant Slimmer of the Year 2018”. Laura had struggled with her weight since childhood and when she eventually left home her eating habits revolved around ‘less than healthy’ options. “….I’d have a takeaway for breakfast, lunch and dinner. Unsurprisingly, the weight piled on very quickly and, before I knew it, I was almost 19st. When Laura became pregnant with her son, Joshua , and then later her daughter, Charlotte (now 12yrs and 9yrs respectively), she remembers feeling disappointed people didn’t congratulate her or ask her about the baby – and she thought it was because her weight meant that she didn’t look obviously pregnant. She also realised that as the children got older – and started to get more active – she could miss out on quality family time as as she wasn’t ‘fit enough’ to keep up with them. ‘The turning point came when my husband and I went to Alton Towers and decided to go on the ‘Air’ ride. After a bit of a struggle I managed to get the harness to fit, but as the ride started I began to panic that it wouldn’t be able to hold my weight. “I cried the whole way round. Worst of all, it took three men to get me out of the harness. I was so mortified – especially as everyone in the queue looked on – that we just went straight home afterwards. Laura started cooking meals from scratch rather than depending on ready meals. Other family members were supportive and, as the numbers on the scales started going down, it spurred her on to become as healthy and happy as possible. It was a couple of years ago when Laura and her family moved to Enderby and shortly afterwards she left her full time job with a national pharmaceutical retailer to become a Slimming World consultant. Laura is also more active these days. Since losing weight, the family have adopted three dogs – who love long walks! 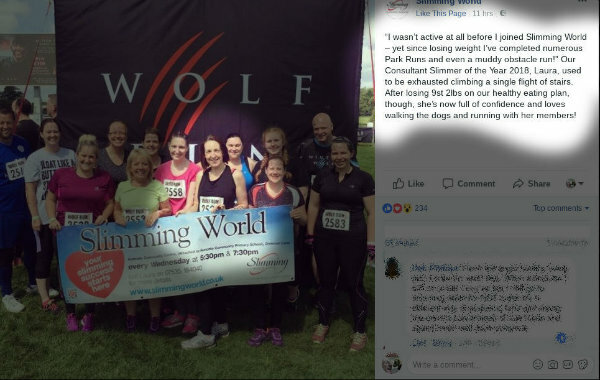 Laura’s also completed numerous Park Runs and even a muddy ‘Wolf Run’ obstacle run. 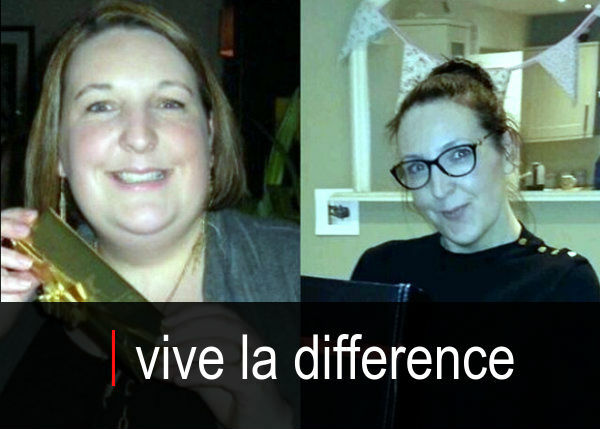 Laura is committed to helping others and as a Slimming World consultant she gets much satisfaction from “making a difference” to other people’s lives. Laura runs a group at Huncote Community Centre, (Attached to Huncote Community Primary School) Denman Lane, Huncote, LE9 3BS. The group meet Wednesdays 5:30pm and 7:30pm. Narborough, LE19 2DF Mondays 9.30am, 5:30pm and 7:30pm. “Slim with Laura” on Facebook.